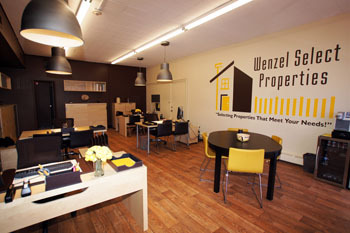 Wenzel Select Properties location is 924 Warren Avenue in Downers Grove, Illinois. Our real estate office is in the heart of downtown Downers Grove. We are just minutes away from Interstates 88, 355, 55, 290 and 294. Wenzel Select Properties real estate brokers are available to meet with you 7 days a week – Monday through Sunday. You can call us for an appointment at (630) 430-4790. The Village of Downers Grove, IL, is located 22 miles west of Chicago. Convenient access to Chicago via rail and several major expressways make Downers Grove a prime location to live, work and do business. Several major corporations have business operations in Downers Grove including Advocate Health Care, Dover Corporation, Pepperidge Farm, DeVry, Inc. and Sanford, maker of Sharpie and Paper Mate. Highly ranked schools were a top factor in Downers Grove being named one of the Top 10 Livable Cities for Kids by Livability.com. Downers Grove has also been recognized by Forbes as one of America’s Friendliest Towns. Wenzel Select Properties is a real estate company specializing in homes for sale, home buying, and property management. We are located at 924 Warren Avenue in Downers Grove, Illinois 60515. Our realtors have clients from Downers Grove, Darien, Willowbrook, Lisle, Oak Brook, Lombard, Westmont, Woodridge, Glen Ellyn, Burr Ridge, Hinsdale, as well as other Chicago locations. Call a Wenzel Select Properties Real Estate Broker at (630) 430-4790.